Infrared satellite imagery shows scientists where the coldest cloud tops are located in a tropical cyclone and can give a clear picture of wind shear's effects. NASA's Aqua satellite data showed wind shear was pushing Tropical Depression Lane's strongest storms east of its center. Despite the wind shear, Lane strengthened back into a tropical storm on Aug. 27. On Monday, August 27, 2018 there were no coastal watches or warnings in effect. However, NOAA's Central Pacific Hurricane Center or CPHC said that interests in the Northwestern Hawaiian Islands should continue to monitor the progress of Lane. 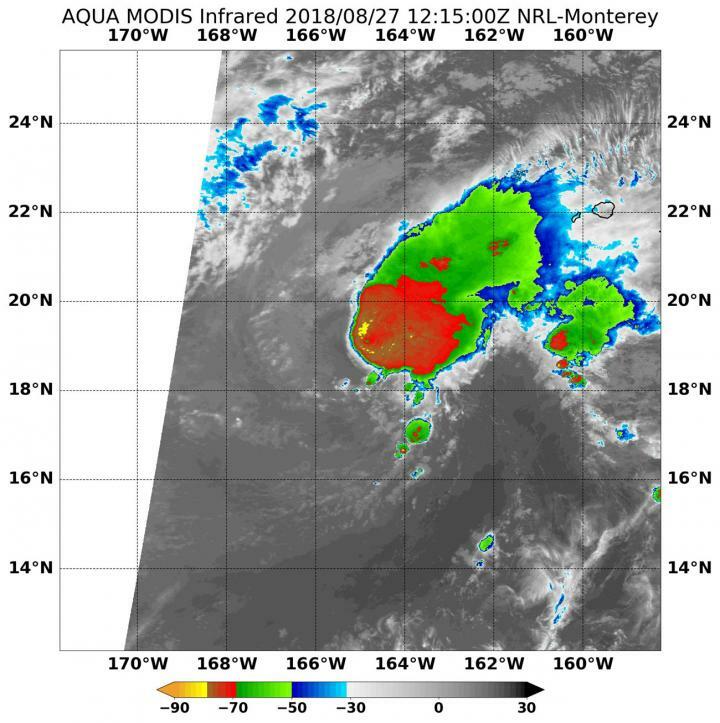 At 8:15 a.m. EDT (1215 UTC) the Moderate Resolution Imaging Spectroradiometer or MODIS instrument aboard Aqua measured cloud top temperatures in Lane when it was a depression. Coldest cloud tops were near minus 70 degrees Fahrenheit (minus 56.6 degrees Celsius), east of the center. Those storms were being pushed there by strong westerly winds. Storms with cloud top temperatures that cold have the capability to produce heavy rainfall. Fortunately, that heavy rain is falling over open ocean waters. The infrared imagery showed that those strong storms were not reaching the Hawaiian Islands. By 11 a.m. EDT (5 a.m. HST/1500 UTC), NOAA's CPHC said that Lane regained strength and was upgraded from a tropical depression to a tropical storm. At that time the center of Tropical Storm Lane was located near latitude 18.9 degrees north and longitude 165.5 degrees west. That's about 520 miles (835 km) west-southwest of Honolulu, Hawaii. Lane is moving toward the west near 8 mph (13 km/h), and this motion is expected to continue today. A decrease in forward speed is expected tonight as Lane makes a turn toward the northwest. Lane is then expected to accelerate toward the northwest on Tuesday, Aug. 28 and Wednesday, Aug. 29. Maximum sustained winds are near 40 mph (65 kph) with higher gusts. Some short-term weakening is forecast, and Lane is expected to become a post-tropical remnant low by Tuesday. Lane may strengthen as an extratropical low as it passes over portions of the Northwestern Hawaiian Islands from Tuesday night through Thursday, Aug. 30.